The arrow should have been pointing up! We spent the afternoon of Christmas Day shuttling from San Pedro to Antigua and arrived just after dark, making our way to our hotel by tuk-tuk. 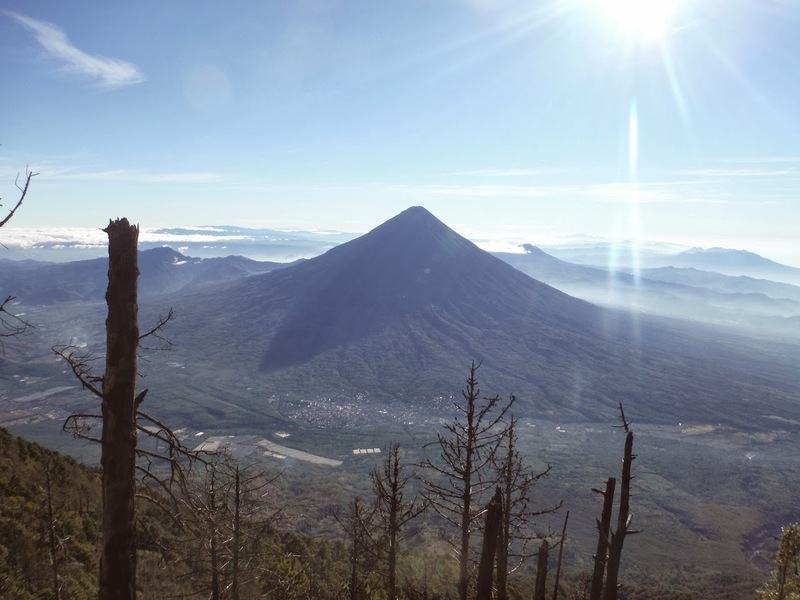 We had coordinated with our friends Rob and Cody to meet up in Antigua for the Volcan Acatenango trek. We had just a short night before that trek began, so we took a walk though town to check out what we could about Antigua. Although the town is not that large (especially the downtown area), coming from San Pedro it felt like we had landed in a big city - there were even regular-size cars on the road! As in San Pedro, there were a bunch of holiday fireworks going off all over the city so we stopped on a few corners to check them out as we wandered around. Architecturally, all of the buildings in Antigua's center look very similar - one story, few windows to the outside, and large doors leading to inner courtyards. Its the type of place where you can't really tell what may be going on inside until you venture in to take a peek. We found what looked like a decent restaurant, with local foods, and sat down for our Guatemalan Christmas dinner! The next day we set out for our overnight hike to Volcan Acatenango. We consolidated the stuff we thought we'd need into one pack and left everything else at the trekking agency office. Our group consisted only of four - us plus Rob & Cody, we wouldn't realize until the next day just how important it was to have a small group, in addition to our decision to hire two porters to help carry the camping gear. The porters on this trip had a unique way of carrying their load, using a strap that went around their foreheads and connecting to the load which rested on their back. Rob & Cody won the minimalist award for having only one incredibly small backpack. I took our daypack while Juli took a gallon of water. We traversed three zones on our way to our campsite: 1) cornfields, 2) cloud forest, and 3) pine forest; stopping for lunch just after the cloud forest section. We reached the campsite (about 12,000 feet) at about 2:30 - according to the guide this was really good time, he said normally groups have just made it out of the second section by that time. We made the decision to do the summit at sunset (vs waking up at 0-dark-30 and doing the summit at sunrise). 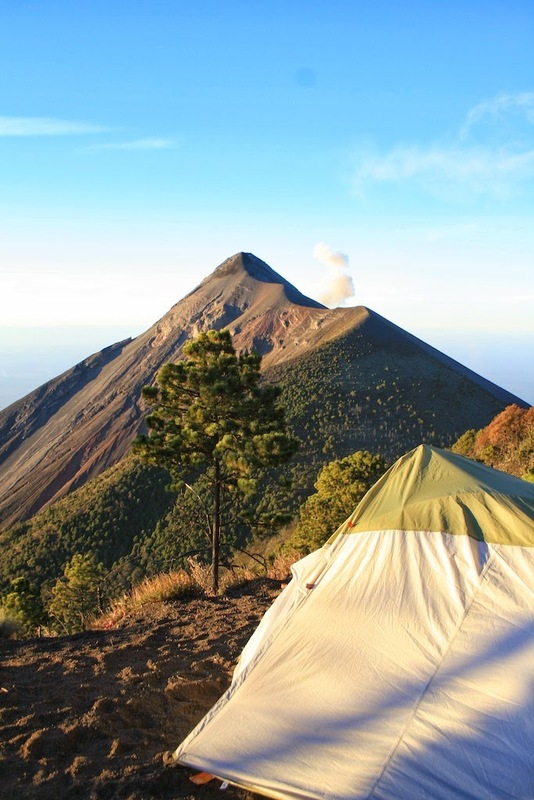 We spent a couple hours making camp and admiring the views of the Guatemalan landscape, particularly Volcan Fuego - the nearest volcano to Acatenango and one that is active. Supposedly its pattern is to erupt one day and stay quiet the next - we had heard it was quite active the evening before so we were hopeful we'd get a few nature shows; even before we left for the summit it complied with a big rumble and a blast of ash out the top. According to our guide, the summit hike was about 45 minutes - but for us it took nearly 90. 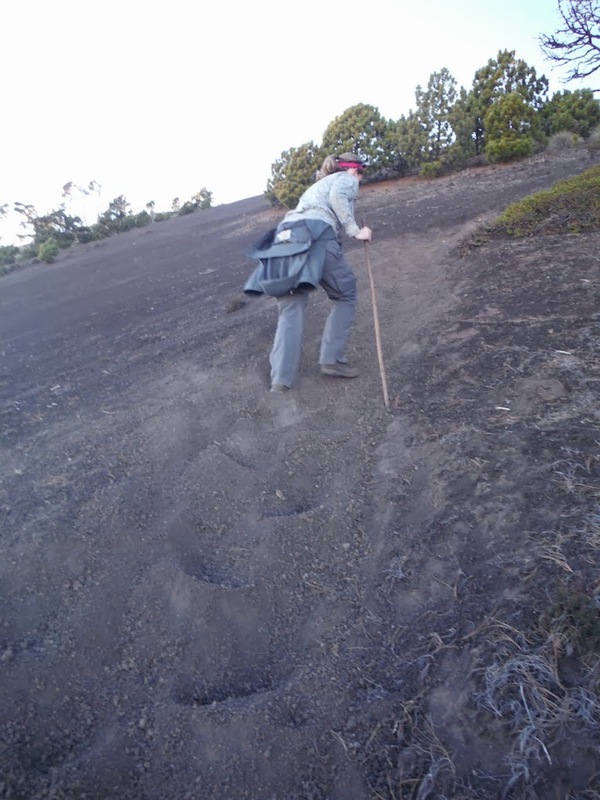 It was a frustrating surface, loose scree/gravel where you slip back half a step for each step forward; as we neared the summit the grade got steep, requiring us to go on all fours to keep our balance. I think the altitude was starting to get to us a little bit, as was the exertion we had put out all day. Every time we thought we would have reached the summit, it just kept extending up to its peak of 13,000 feet. There were times I seriously doubted I would continue, so I tried to focus on small segments - "make it to that rock," and finally just in time for the sun to disappear behind the clouds, we reached the summit. The summit was otherworldly - a stark black, sloping gravel cone above the clouds. Various volcanic peaks poked up, and we got a few brilliant moments of sunset light as we tramped around the cone and took photos. Fortunately for us it was not too windy at the summit and the temp was around 40 degrees Farenheit. Of course, the sun had set when we were up at the top which meant we had to navigate our way back down the steep scree in the dark (I had a headlamp and Juli had her trusty iPhone - we had let Rob & Cody borrow our flashlight). While still a bit scary and exhausting, going down the scree is a little bit better because you can kind of "ski" down it like you're doing moguls. Of course, I absorbed a good pound of sand into my shoes while doing so (I only brought water shoes on the trip). Finally we made it back to camp where the fire was roaring and dinner was on the stove. We busted out the bottle of rum we bought in Antigua and chowed down on some tasty pasta tacos (yeah, a real carb fest!) All the while we were keeping eyes & ears on Volcan Fuego, hoping for a few eruptions…and we were rewarded with a couple small ones. Not as spectacular as Arenal was in Costa Rica many years ago, but still awesome to be close enough to a live volcano to hear and see the hot red rocks tumbling down the mountain. It was still an early bedtime, and the temperatures dropped down to nearly freezing as we fell asleep, Fuego rumbling quite a few times along the way. I woke up before sunrise the next morning to try and get some good photos. Sadly none will capture the vista we had from our campsite, with the sun shining pink and orange over the green farmlands, volcanos rising pointedly into the sky, and the Pacific Ocean visible near the horizon. After a quick breakfast we packed up and got on our way back down, making it back to the starting point of the hike in about 3 hours. There, gearing up to make the trip we just completed, was a huge group of at least a dozen people, some of whom had huge packs strapped to their backs and others that were wearing blue jeans that did not look very flexible…thinking about the hike we had completed the day before, not including the summit portion, we really hoped that group knew what they were in for! We offered up our walking sticks (Juli had carried hers all the way from San Pedro) to give them a hand on their way both up and down. Overall, I'd put the trek right up there with the summit day from our Kilimanjaro hike; it was a shorter day of hiking for sure, but the terrain (scree) was pretty similar. At least on Acatenango our water bottles did not freeze, and our hand warmers even worked to help heat up our sleeping bags overnight! 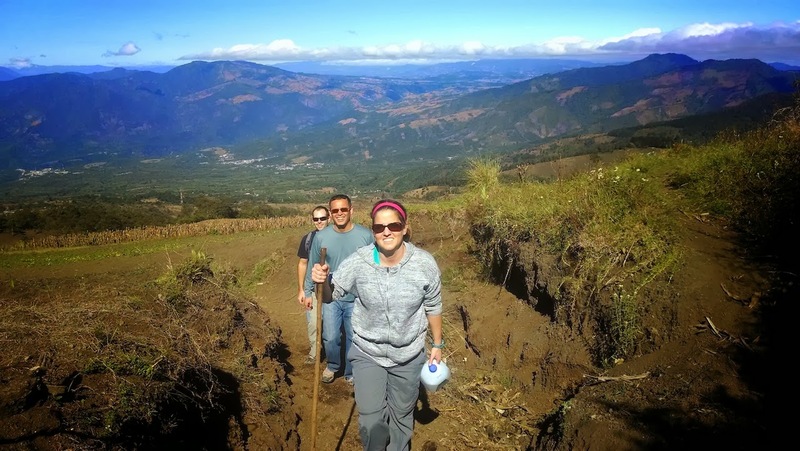 We had a flight to catch from Guatemala City; Rob & Cody needed to get to Lake Atitlan, so as soon as we got back to Antigua and cleaned up a little bit in the agency office, we found a travel agent running shuttles to both places. Though our flight wasn't until 5pm, we didn't want to risk running into traffic on a 2 or 3pm shuttle so we jumped on the 12pm shuttle to Guatemala City, and we made it in plenty of time - giving us about four hours to kill time in an airplane hangar (at least it had wifi, so we could email dive shops in Caye Caulker to try and lock down at least one diving trip at our last stop). Your blog, as always, is fantastic! I really enjoy reading and seeing your adventures to places I will never get to experience.Takes a lot of stamina to do so! What a wealth of memories you are creating!! wow, what a hike. you two are the most awesomest people in the world. Thanks for telling me to put "www" in front of the website name so that I could check out your trip.